Patsy Cline had one of the most distinctive voices in American music – a seemingly perfect combination of purity and power. Unfortunately, her career was cut short before she got around to recording a Christmas album. Enter Mandy Barnett, a singer with a voice so startlingly similar to the late Cline’s, it’s as though the latter never left this world. That’s not to say that Barnett is an artistic clone without a musical vision of her own. But the vocal resemblance is uncanny, and Barnett’s milieu of choice is the classic country of the 1950’s, when the likes of Cline and Brenda Lee ruled the charts. Barnett set out to capture that period sound, a smooth blend of steel guitars and syrupy strings with her strong, clear voice firmly up front, applying it to a collection of seasonal standards that’s as easy to take as a crackling fire on a snowy winter’s night. 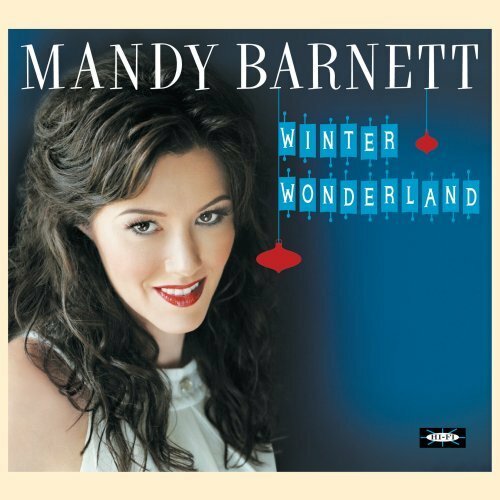 With note-perfect ‘countrypolitan’ arrangements, she emulates the great Owen Bradley (Cline’s producer) with her own take on such familiar fare as ”Winter Wonderland,” “I’ll Be Home For Christmas,” and perennial favorite “White Christmas.” Indeed, there aren’t really any surprises here, but Christmas albums aren’t really supposed to be edgy or artistically adventurous – a season of traditions demands a traditional approach. And so we get well known songs drenched in chirpy background vocals and the aforementioned strings – they’re omnipresent here – for a sound that leans much more to the cosmopolitan than the country. True, the steel guitar emerges from the mix fairly often, but there are only occasional traces of fiddle and banjo. And yet there’s simply no mistaking this as anything but a country collection, albeit one for people who prefer a chilled martini to a cold beer, and who don’t really like to get mud (much less worse!) on their shoes. And in the end it all comes down to the voice, and there simply aren’t many as rich and powerful as Barnett’s. The material may not be challenging – again, Christmas collections are meant to comfort, not confront – but she’s magnificent, with a natural vibrato and that little, sobbing catch that Cline worked so well. It is, quite simply, an utterly beautiful instrument, and it’s perfectly served by the bouncy arrangements. Sure, they’re sweetly saccharine, but rarely overdone – at least not in the context of the style and the period. It’s the sound of tradition, and what better time of year for a traditional sounding collection? Radiating with the warm glow of a simpler time and a season of comfort and joy, this one’s a winner that deserves the status of a seasonal classic.